The 'Mare de Déu de Loreto' holidays symbolize the end of Summer. 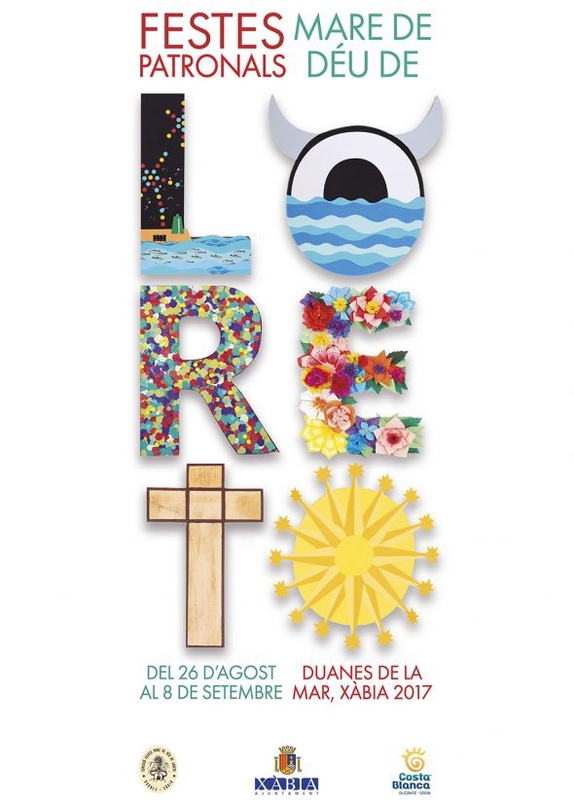 From the end of August until the 8th of September, the Duanes de la Mar neighbourhood dresses in its best finery to celebrate the centennial holidays of its Patron Saints: the Virgen de Loreto and Cristo del Mar. The origin of these holidays is due to the arrival of an Italian ship in 1850, which ran aground in Cap Prim with the 'Virgen de Loreto' statue on board. This statue was salvaged jointly with the ship's bell by the Xàbia fishermen who adopted her as their Patron Saint. These festivities have a well-defined maritime identity since this neighbourhood has been traditionally linked to export and fishing activities. The festivities offer an extensive program, where we highlight the popular “bous a la mar” (running the bulls into the sea) in the jetty where participants jump into the sea to avoid the horns of the young bulls. One venerated holiday tradition is visiting the popular “baret” (little bar) which the Festivities Commission sets up in the “bous a la mar“ area to enjoy the festive atmosphere and enjoy delicious snacks made with the day's fresh catch of fish and sea food from the local fish market. Numerous activities such as the commission's street parades, flower offering, and musical performances take place during these holidays. On the last day, 8th of September, solemn religious ceremonies are held in honour of the 'Mare de Déu de Loreto' and the holiday concludes with a splendid fireworks display which is launched from the sea and they are always astonishingly beautiful in the charming setting of Javea bay. 21: 30 h. NIGHT OF HUMOR in Severo Ochoa Street. The theater group of the Comissió of Festes de Deu de Loreto Mare, TOT RIST, Will represent the fun sainete: The Nano Barraque Of Paco Barchino that was originally released in Valencia in 1921. There will be bar service. From 10.00 h. Up to 13: 30 h. And 17.00 h. To 20: 30 h. V Blood Donation Marathon Dionis Henarejos. The Transfusion Center of the Comunitat Valenciana will be transferred to Customs Comissió of FestesOn Calle Severo Ochoa. 21: 00 h. IV WINE TASTING MARE DE DÉU DE LORETO. Under the theme Rioja and Ribera del Duero face to face, We will know these two emblematic Denominations of Origin and we will approach their wines through the exercise of Cata. The event will be led and guided by the winemaker Graciela Pena Valente, from VinoVitaro, and the collaboration of the sommelier Raúl Caselles from the Bodega Miguel y Carrasco salons. They collaborate: Bodegas Tinto Pesquera, Grupo Pesquera - DO Ribera del Duero, Bodegas Ortega Ezquerro - DOCa Rioja, Bodegas Viña Pedrosa, Hnos. Pérez Pascuas - DO Ribera del Duero and Bodegas Remelluri, La Granja Ntra. Sra. De Remelluri- DOCa Rioja. Maximum registration 70 people upon payment of 12 euros on the 22 day of August in the couple fester, in the street Severo Ochoa, from the 19 h. Until 21 h.
20: 30 h. Mass in suffrage for the souls of the deceased of the Parish and solemn BESAMANOS in the image of our patroness, the Mare de Déu de Loreto. The Commissio de Festes will offer two bouquets of flowers to our deceased presidents and members of the Commission. 22: 00 h. Concert by Ars Nova Polyphonic Group Cant a la Natura In the parish of Our Lady of Loreto. 11: 00 h. XII Children's Fishing Competition Peña The UCA in the Port of Xàbia. Entries (up to 12 years) will be made from 10 h. And each participant must bring his own cane. 17: 00 h. XXXVI Cyclist Trophy Peña La Bufa. (Separate program). 23: 00 h. PRESENTATION OF 2017 PARTIES. Presentation of the Mayoresses and Mayoral representatives of the 2017 Festivals on Jaime I Avenue. Next, performance of the orchestra MONTECARLO until the 05: 00 h.
From 09: 00 h. To 14: 00 h. VIII Contest of Quick Painting José Lledó. The presentation will be made in the Fisherman's Market and the inscription can be made in the addresses and numbers that appear next to the bases in the Book of Holidays. Subsequently there will be an exhibition of the works participating in the Soler Blasco Museum of the 6 to the 29 of October. The awards ceremony will be held on October 14 in the Lonja during the dinner of the XII Trobada of traditional Barques of Xàbia. 09: 30 h. Children's Raspall Tournament in the Virgen de Loreto street. 10: 00 h. XXXVI Popular Race Peña La Bufa. Entries will be made in advance Cala Blanca, The starting point of the race. 10: 00 h. XXVI Chess Championship Mare de Déu de Loreto (XXIX Open Vila de Xàbia) on Severo Ochoa Street with the participation of numerous national and international masters. The registration of minors of 12 years will consist of the donation of a 1 kilo of non-perishable food to the benefit of Caritas Ntra. Sra. De Loreto. Organizes Club d'Escacs Xàbia and Commissión de Festes. 11: 30 h. Departure from Llargues with Xàbia palm harvesting against El Poble Nou de Benitatxell in the street Virgen de Loreto. 12: 30 h. Pasacalle of the Comissió de Festes touring the streets of Customs. In the end, the 2017 Mayorals will invite us to indulge in gogó in the street Virgen de Loreto. 17: 00 h. XXVII Championship of Raspall between Peñas Marineras in the street Virgen de Loreto. 17:30 h. I Beer Pong Mariner Organized by the Peña La Porcà in the Campus of Peñas. Seniors can register by contacting members of the Peña until Friday 25 in August. There will be bar service. 18: 30 h. Extraordinary Departure of Raspall in the street Virgen de Loreto. SARIERO and FERRER de Gata and TOMAQUETA de Xàbia against SERGIO, JOSELE and SOMETA of Oliva. 20: 30 h. Concert of the Youth Band of the Musical Artistic Center of Xàbia in Paseo Jaime I. 22: 00 h. Brotherhood Dinner on the Paseo Marítimo. The Comissió de Festes will invite all the attendants to the aperitif, the drink and the dessert. Then dance with the SYBERIA orchestra until 03: 00 h.
17: 30 h. Championship of Futbol organized by the Peña La Porcà in the track annexed to the school Port of Xàbia for all that has between 15 and 21 years. Entries can be made until August 22 through the members of the Peña. There will be refreshment bar service. 22: 30 h. Sensational unprecedented performance of the Festes Commission on the Paseo Marítimo with which we will make a tour of the most known and endearing music of the 70, 80 and 90 years. 17: 30 h. Continuation of the Futbol Championship. 19: 30 h. Presentation of the book Thirty fascinating women in the history of Valencia In the Customs Library. It is a choral work where thirty authors write about thirty other great fascinating women. 22: 00 h. Brotherhood Dinner at Doctor Fleming Street. The Comissió de Festes will invite the aperitif, the drink and the dessert. There will be a big raffle between all the attendees. Then, performance of the BRADMIS orchestra until the 03: 00 h.
22: 00 h. Dinner of Brotherhood in the zone Bartolomé Ros. The Comissió de Festes will invite the aperitif, the drink and the dessert. Then dance with the BRADMIS orchestra until 03: 00 h. During the day, the neighbors of Customs will begin to decorate their homes, facades, streets and shop windows for the holidays this year. The merchants association Xàbia Port has convened two extraordinary contests with which it wants to encourage to beautify the streets of the nucleus during the patron saint festivities and reward the creativity and dexterity of the most unique decked out. The bases and deadlines of both contests are in the 2017 Book of Fiestas. The Commission of Festes encourages all the neighbors, businesses and establishments to participate in order to bring the festive atmosphere to all corners of the Customs of the Sea and contribute to a greater display of our parties. 12: 00 h. BOUS A LA MAR with Benavent cattle breeding and inauguration of the world-famous Baret dels Bous to the Sea 2017. Tribute and minute of silence in memory of Edu Monfort, Vicent Serrat and José Moya. 19: 00 h. BOUS A LA MAR with livestock ELS COVES. 23: 30 h. BOUS AL CARRER in the Port Area. I CHALLENGE 'EDU MONFORT GASENT' AMONG GANADERÍAS. The IFACH cattle ranch will compete with the cattle ranch JOSÉ VINCENT MACHANCOSES with two cows and a bull on each end. The winner of this challenge will be met on Monday night 4 against the winner of the 2016 Challenge, livestock HERMANOS CALI. During the challenge will begin the I COW ANIMATOR CONTEST and in it will participate the couples Jordi and David (Fichaje) and Javi and Pepito. 23: 00 h. Discomóvil Fluor Party in charge of Bit Sound on the Paseo Marítimo until 04: 00 h. Organized by Peña El Tremoló on its 5th Anniversary. 12: 00 h. BOUS A LA MAR with livestock LA PALOMA. Sánchez-Guirado on Severo Ochoa Street. 19: 00 h. BOUS A LA MAR with livestock CRESPO. 23: 15 h. Exhibition of DOMA DE CABALLOS in the bullfighting area. 23: 45 h. IV CHALLENGE BETWEEN DIFFERENT ARTS OF NATIONAL TRIMMERS. Then release two cows for the most bullfighters ELS COVES livestock. During the contest will not be allowed access to the arena of people outside the show for the display and safety of the participants. 00: 00 h. Aibax & Bup with the music of the DJs José David Bou and Christian Blond organized by the Peña La Bufa on the Paseo Jaime I until the 04: 00 h.
SATURDAY 2 OF SEPTEMBER. DAY OF THE PEÑAS MARINERAS. 09: 30 h. XVIII Ping-Pong Open Mare de Déu de Loreto organized by TEMEXA. Entries can be made that same day at the Palau Municipal d'Esports. 10: 00 h. XV Basketball Tournament 3 × 3 Mare de Déu de Loreto (from Benjamins to Cadets). Organize Club Bàsquet Joventut Xàbia. Registration at the Palau Municipal d'Esports until 10h. 11: 00 h. Great Gymkana test for the most intrepid Peñas organized by the Peña La Porcà in the Campus. 12: 00 h. BOUS A LA MAR with livestock BENAVENT. At the end, food of brotherhood between the Comissió de Festes and the Peñas Marineras. 16: 00 h. Continuation of the 15th 3 3 Basketball Tournament Mare de Déu de Loreto (juniors and seniors). Organizes Club Bàsquet Joventut Xàbia. 17: 30 h. Fun musical pasacalle of the Peñas Marineras to the bullfighting arena. 19: 00 h. BOUS A LA MAR with livestock HERMANOS CALI being the first time in its history that makes an exhibition of this modality. 00: 00 h CARNAVALIA ON TOUR. Macrodiscomóvil in the avenue Augusta that fuses in a same spectacle the best music of the moment, animation, live performances and special effects. Until 05: 00 h.
09: 00 h. Despertà infantil carried out by the little ones in his big day of the celebrations with the participation of the youngest musicians of the School Xirimitab's of Xàbia. All children who want to participate must bring their own instrument to make noise in Jaime I Avenue. The Festes Commission will provide an instrument to all those who do not have one. 10: 00 h. Chocolatada organized by the Comissió de Festes and prepared and distributed by the neighbors of Doctor Fleming Street in Paseo Jaime I. We will continue with popular games in the street Triana organized by the peñas La Penyeta Roja and Pili La Banyà and with the collaboration of the Neighbors of Triana. Afterwards, traditional merengade on the Paseo Marítimo organized by the Comissió de Festes. At the end, water party with the collaboration of Transport Montgó. 11: 00 h. Inauguration of the Children's Park and Aquajocs in Paseo Jaime I. 11: 30 h. Exhibition of old vehicles on Doctor Fleming Street. 12: 30 h. Traditional Soap Stick in the Bullfighting Camp with the collaboration of Peña La Bufa. 13: 00 h. Carretons to the Sea in the Bullfighting Camp for the smaller bullfighters and bullfighters. Parents are asked to collaborate in order to ensure that their sons and daughters are better supervised if they intend to go to sea. 14: 00 h. Paella, soft drinks and ice cream for all children offered by CELDA SL. And Supermarkets Coaliment in Severo Ochoa Street. 20: 00 h. CABALGATA DE CARROZAS with the participation of numerous musical groups and animation and the funny satirical critic of the Peñas Marineras. 00: 00 h. Spectacular CORREFOCS in charge of the Colla de Dimonis de Mislata that will tour the main streets of Customs filling them with fire, music and color. Next, discombile in the Paseo Marítimo organized by the Peña Els Golossos and with the collaboration of Duplex Bar bacoa with the Dj Saves Burches until the 04: 00 h.
12: 00 h. BOUS A LA MAR with livestock CRESPO. 19: 00 h. BOUS A LA MAR with livestock LA PALOMA. 23: 30 h. BOUS TO THE SEA in the Port Area. End of the I CHALLENGE 'EDUARDO MONFORT GASENT 'AMONG GANADERÍAS in which the winner of the 31 2017 night of August against the cattle breeding HERMANOS CALI, winner of the year 2016, will compete with two cows and a bull in each one of them. The livestock that obtains more points by the jury, will get a prize of 300 euros. From 10: 00 h. To 14: 00h. Itinerant planetarium for the little ones (until 13 years) in the cloister of the Parish of Our Lady of Loreto. In it you can discover constellations, comets, nearby planets and galaxies. 10: 00 h. VII Great Cagada organized by the rocks La Bufa and La Comuna in the Bullfighting Camp with lunch popular for all the attendees. The prize for the winner will be given during the afternoon bullfighting session at the Baret dels Bous. 19: 00 h. BOUS A LA MAR with livestock BENAVENT. Great afternoon of TOROS with the release of five bulls and two bulls. Then, great end of celebration of the taurine performances and CLOSING of the mythical Baret de Bous to the Sea by end of season. 23: 00 h. La Porcà Discomóvil celebrating its V anniversary on the Paseo Marítimo with the collaboration of Bar-Restaurant L'Almadrava and the music of DJ's Esteve Bas and Juanjo García. Until 03: 00 h.
10: 30 h. In the couple of the Peña La Bufa, brisca contest for the elderly of 50 years. 12: 00 h. Award of the 25th Dionis Henarejos Crespo Children's Drawing Contest at Severo Ochoa Street with a fun performance for all attendees. 12: 30 h. La Peña La Bufa will invite an aperitif to our elders. 13: 00 h. Turning General of Bells announcing the proximity of the religious celebrations in honor to our patrons. 18: 00 h. La Peña La Bufa will visit the Hospital Hermanos Cholbi Hospital. 20: 00 h. OFFER OF FLOWERS TO THE MARE OF DÉU DE LORETO. The Comissió de Festes invites all the clubs, streets, associations, parties, neighbors of Customs and all Xàbia to participate in this very endearing event. 22: 30 h. Sainete Alium Played by the Theater Group Montgó de Xàbia In the street Doctor Fleming, with the collaboration of the Peña La Bufa. 00: 00 h. NIGHT OF RONDA TO MAYORALES AND MAYORALES in charge of the Tuna of Xàbia beginning the act in the Parish of the Sea. At the end, in the street Severo Ochoa, will be offered a wine of honor, courtesy of the Mayorals of 2017 and the Commission Of Festes. Then, performance in concert of the group LA MOCHA on the Paseo Jaime I until the 03: 00 h.
09: 00 h. Pilatrix musical parade through the streets of Customs organized by the Pili La Banyà and Liatrix. 09: 00 h. General turn of bells signaling the celebration of the day in honor to the Santísimo Christ of the Sea. 11: 30 h. Traditional visit of the 2017 Mayorals and Commissio de Festes al Asilo Hospital Hermanos Cholbi and the Center of Holy Day of Bethany. 13: 00 h. Informal pasacalle by the streets of Customs of the Mayoralesas, Mayorales and Comissió de Festes until the street Santísimo Christ of the Sea. 13: 30 h. FESTA DE CARRER in the Santísimo Cristo del Mar street organized by the Pili la Banyà and Liatrix Peñas. During the celebration, the association of merchants and hoteliers Xàbia Port will announce and deliver the prizes to the winners of the contests of showcases and decked façades and decked streets. 19: 00 h. Pasacalle with the Band of Music and the Commission of Festes to visit the decorated streets and to accompany the Mayoralesas and Mayorales to the parochial temple. 19: 30 h. Celebration of the Eucharist (the Mass will be sung by the Parochial Choir), and then the solemn PROCESSION OF THE HOLY CHRIST OF THE SEA through the streets of Customs. At the end of the procession, traditional MASCLETÀ DE COLORS in the avenue Jaime I. 23: 30 h. MUSIC HALL show on the Paseo Marítimo that combines music, dance, acrobatics, magic and risky numbers of fire. Fleming to the 04: 00h. 08: 00 h. Awaken through the streets of Customs in charge of the Commissio de Festes. 09: 00 h. General turn of bells announcing the great day of our Patron. 11: 00 h. Pasacalle with the Band of Music and the Commission of Festes to collect the Mayoralesas and to go to the parochial temple. 12: 00 h. Celebration of the Solemn Eucharist in honor to Our Patroness the Mare de Déu de Loreto with the assistance of municipal authorities, Cabildo of the Fishermen's Guild, representatives of other Festivities, Mayoralesas and Mayorales of 2017, Comissió and town of Xàbia. The Mass will be sung by the Parochial Choir. At the end, pass all the attendants to the mascletà enclosure and then deafening MASCLETÀ on the avenue Jaime I. 19: 00 h. Pasacalle of the Comissió de Festes and the Band of Music to pick up the Mayorals and Mayoralesas and accompany them to the parochial temple. 20: 00 h. Solemn PROCESSION OF THE MARE DE DÉU DE LORETO through the streets of Customs. 00: 00 h. Dance with the EUFORIA orchestra on the Paseo Marítimo. 01: 00 h. Sensational AQUATIC FIREWORKS CASTLE with which we will close the Festivities in honor of the Mare de Déu de Loreto 2017. At the end, the dance will continue with the orchestra until 04: 00h.